The unforgettable March blackout of Boston’s Back Bay was the largest power outage in decades. ElecComm Power Services provided support and services to the area, solely organizing and executing every aspect of supplying temporary power to the district. The task was large; diverse obstacles arose making the task of supplying temporary power to the neighborhood a challenge. As summer-like weather called for New England temperatures to be in the mid-80’s, EPS prepared for possible heat related failures as they continued the power relief effort. Just as predicted, a secondary transformer started heating up while taking on more and more of the district’s power demand off of EPS generators. The transformer was found in a confined space discharging 11 million BTU worth of heat. The small room that housed the electrical device and the limited space of the city’s narrow street made standard cooling methods impossible to achieve. Instead, EPS devised a plan to cool the fins of the transformer by supplying 100 tons of A/C, creating 64,000 CFM of cold air across the fins to simulate winter-like conditions during the unseasonably warm weather. Because of the prompt, safe, and efficient action of ElecComm Power Services, the transformer was cooled and remains in operation. EPS efficiently adapted to the difficult situation and properly managed obstacles caused by extreme heat, unpredictability of weather, unusual environment, and limited space. The cooling of the transformer will continue for the next few months. To be updated on this story, or to read other stories on how EPS is supporting your community, please visit http://www.eleccommpowerservices.com. 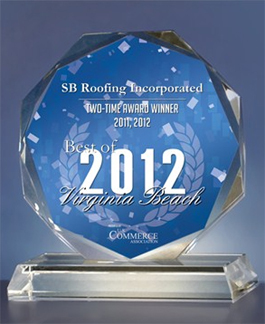 For the second consecutive year, SB Roofing has been selected for the 2012 Best of Virginia Beach Award in the Residential Roofing Contractors category by the US Commerce Association (USCA). Nationwide, only 1 in 70 (1.4%) 2012 Award recipients qualified as Two-Time Award Winners. Your selection as a 2012 Award Winner is a reflection of the hard work of not only yourself, but of many people that have supported your business and contributed to the subsequent success of your organization. Congratulations on your selection to such an elite group of small businesses. The U.S. Commerce Association (USCA) "Best of Local Business" Award Program recognizes outstanding local businesses throughout the country. Each year, the USCA identifies companies that we believe have achieved exceptional success in their local community and business category. These are local companies that enhance the positive image of small business through service to their customers and community. If you need roof repairs, a roof inspection or a new roof, contact the winner of the Best of Virginia Beach Award in the Residential Roofing Contractors two years in a row, SB Roofing, . Trade shows are your company’s chance to debut a new product, find better vendors and suppliers, reach out to potential clients and find new talent to bring in to your company. But if you want to grab people’s attention at a trade show, then you will need to make and follow a plan and use some good trade show techniques. The company that is prepared to maximize the opportunities at a trade show is the company that will walk away feeling like the investment in the event was worth it. One of the biggest mistakes companies make when they prepare for a trade show is a mediocre trade show display and deciding to use the existing marketing materials they have on hand. In order to make a big impact at a trade show, you need to give people something that will make your products stand out. You need to have new marketing materials and pop up trade show displays made up for the products and services you will be featuring at the show. Your company is investing a lot of money into being on a trade show floor. Do not go into the show without having a plan. 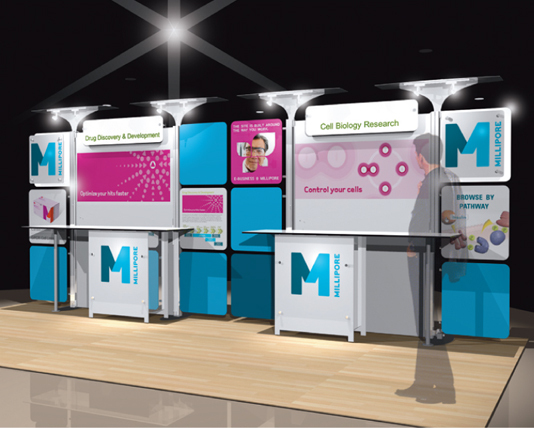 Your trade show booth may look impressive, but if you do not have a message for attendees that they can understand, then you will not draw traffic. If you want to release new products at this trade show, then develop your approach around those products. If you are going to use this trade show to try and attract new distributors for your products, then you will need a presentation more geared towards the benefits of doing business with your company as opposed to just product benefits. If you are focusing on product sales at the show, then you will need sales people and you will need product engineers to answer detailed questions. If your presence at the show is designed to attract vendors or distributors, then you will want members of the logistics team, marketing department and executive team on hand to make a good impression. Too many companies underestimate the power of the free giveaway at trade shows. Giving away toys or notepads with your company logo on them is nice, but if you give people something they can use word will travel fast among the crowds. When you have a good plan for a trade show, then you can maximize your investment in show resources. Take the time to plan your presence in advance so that you can attract more visitors and collect more useful information.